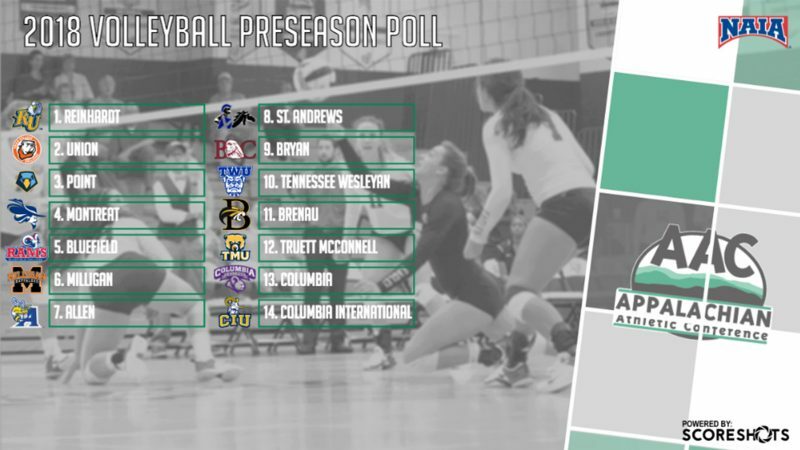 DAYTON, Tenn. – On Thursday, the league released the 2018 Appalachian Athletic Conference Coaches’ Preseason Poll for volleyball, and according to the poll the Bryan College squad is picked to finish 9th of 14 in a highly talented conference. The team to beat this year will be Reinhardt University (Ga.) who is the favorite to win the AAC crown, as the Eagles tallied 13 first-place votes for 195 total points. Trailing behind Reinhardt is Union College (Ky.) with the only other first-place vote, with the Bulldogs collecting 177 total points. Rounding out the top three is Point University (Ga.) with 169 total points. Union won the 2017 AAC Tournament title, the program’s fourth in a row, and advanced to the NAIA National Championship Opening Round. Union ended the year with a 31-11 overall record. Montreat College (N.C.) followed in fourth with 159 points, and Bluefield College (Va.) slid in at No. 5 with 128 points. Once again, the league will be divided into divisions with seven playing in the North Division and seven in the South Division. The teams making up the North Division are Bluefield, Bryan, Milligan, Montreat, Tennessee Wesleyan, Truett McConnell, and Union. In the South Division, the teams are Allen, Brenau, Columbia, Columbia International, Point, Reinhardt, and St. Andrews. The top eight teams in the conference will advance to the 2018 AAC Tournament, which is set for Nov. 8-10 at the MeadowView Marriott Conference Resort & Convention Center in Kingsport, Tenn.
Last season, Bryan battled for an overall record of 6-22 and AAC mark of 5-12, finishing fifth in the competitive North Division of the conference standings. To mention a few highlights from 2017, Head Coach Jessica Day had four players named Daktronics-NAIA Scholar-Athletes, one All-AAC Second Team honoree, one All-Freshman Team member, and a notable seven individuals earn a spot on the All-Academic Team. With a strong incoming class and several key returners that will be impact players for the team, the Lions are determined to make some noise and claw their way back to the top of the conference. To open the season, Bryan will travel to Montgomery, Alabama where they will compete in the Faulkner Invitational, hosted by 2017 Southern States Athletic Conference Tournament Runner-Up, Faulkner University. Over the two-day stretch, the Lions will participate in four matches with two on August 24 and two more the following day. Brewton-Parker College (Ga.) will be the first challenger for Bryan at 2pm on Friday, followed by a 6pm matchup with William Carey University (Miss.) at 6pm. Bryan’s start on Saturday begins at 12pm versus University of Mobile (Ala.) and ends at 2pm against Faulkner.